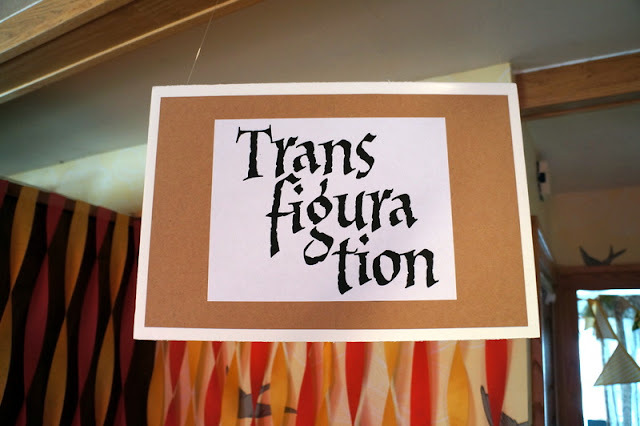 tiny scissor times: A Harry Potter Party. You know how I said we were going to keep things low key for S's birthday, and just have a few buddies over to play and stuff? Well, that was before we had the brain spark of a Harry Potter theme. 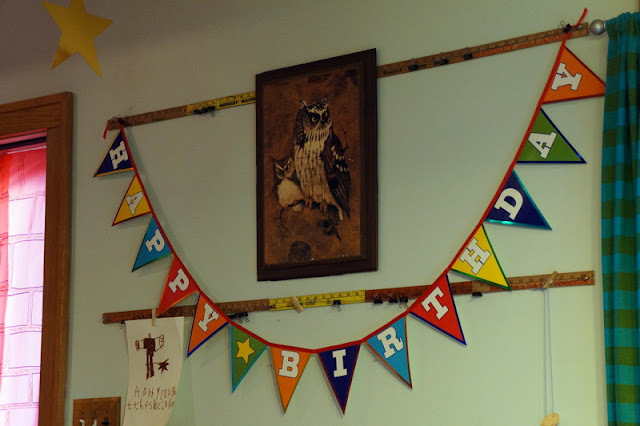 Once I looked around online for ideas, this party spiraled out of control from laid back to completely over the top. It was a busy two weeks, exhausting and at times stressful, full of to-do lists and late nights. 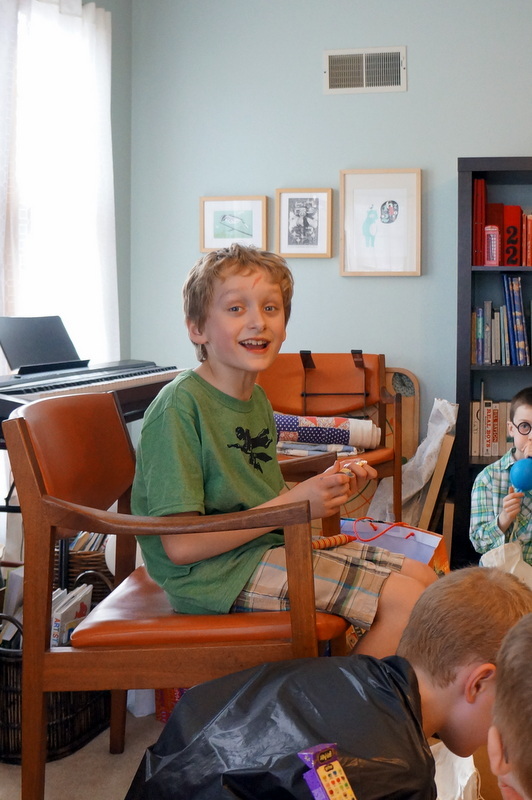 But after hosting 9 energetic boys Saturday, plus my own two, I feel like all the work was worth it. They had so much fun and really got into the theme. Those of you familiar with 9 year olds know that they are getting to an age where they are hard to impress. So to see them enthusiastic about something is a real treat. Ultimately I think that's why I went so overboard with this party: I know S is growing up fast and won't be into themed parties like this for much longer. Plus, when you have an idea this rich with content and details, there's really no limit to what you can do with the party. I could have done so much more. I edited myself a lot, believe it or not. :) Without further ado, here is our Harry Potter party. Enjoy. When we decided on our HP theme the first thing I did was start a Pinterest board dedicated to ideas for the party. What else? :) I did end up using a lot of the ideas there, but not all. 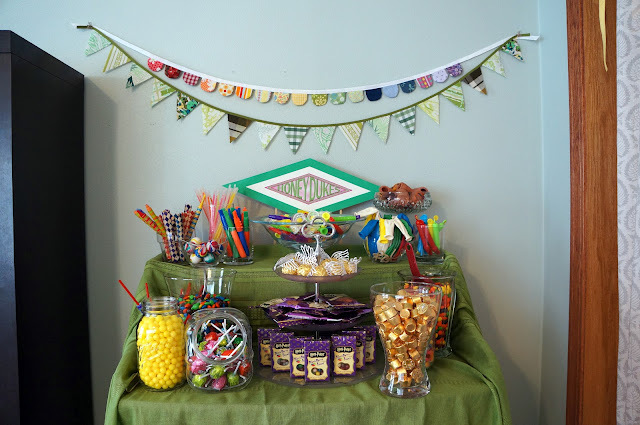 I also posted some of my own party ideas and preparations there for others to see. 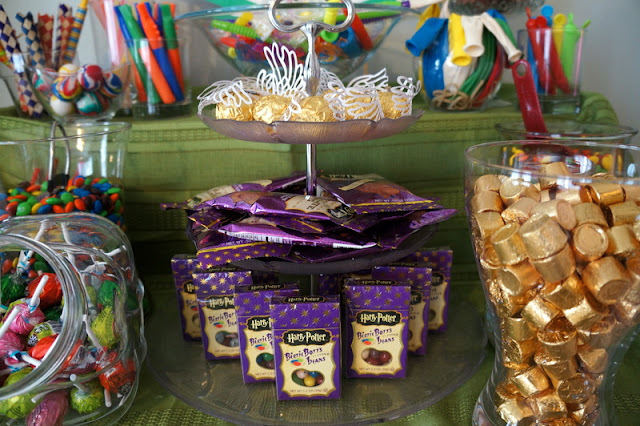 There are so many fantastic HP parties to draw inspiration from. Honorable mention for me go to Emily, Allison, and Marin. Way to go, ladies, and thanks for sharing all your hard work. 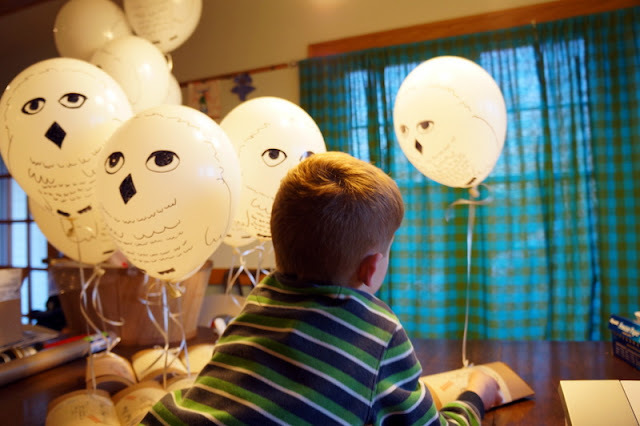 I saw lots of cute ideas for invitations and even though I probably should have been devoting most of my time and energy to the actual party, I just couldn't shake the idea of the helium balloon owl post invitations. So with the help of my mom I got those done a week before the party. (I had sent a "save the date" email the week previous, because I knew I wouldn't have the invites out as early as I'd like.) 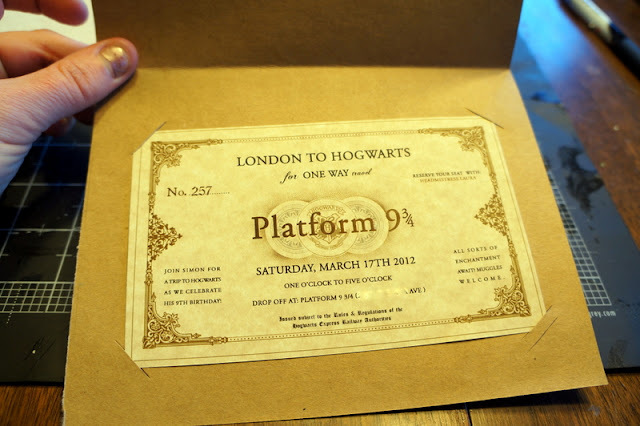 I wrote up a post on my tumblr about the invitations with lots of pictures and links. 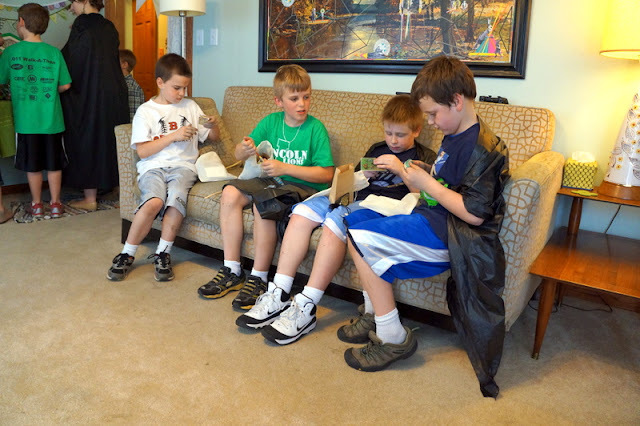 The boys had a lot of fun hand-delivering the invitations and I think the invitees thought they were cool. inside of invitation --- see my tumblr post for all the details. t checking out the invitations. the boys loved delivering the owl post. Okay, party day. For the entrance I hung a 9 3/4 sign (printable here) and recreated the red brick wall using a red plastic table cloth and black and gold Sharpies. 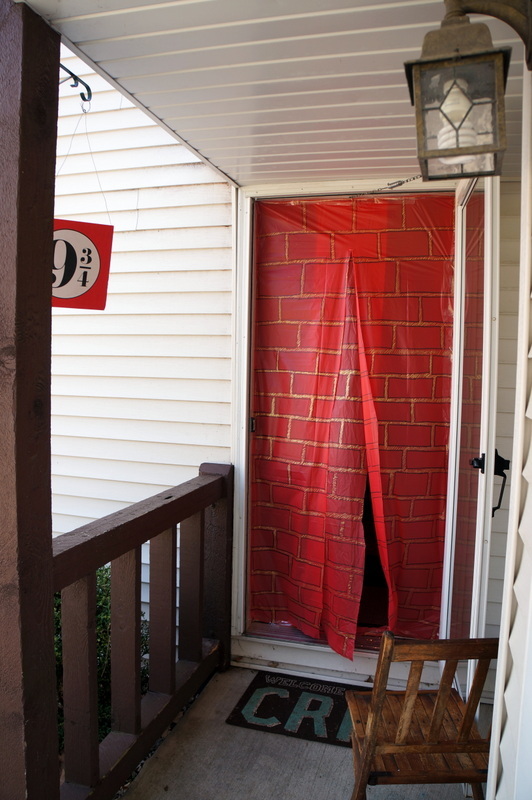 I taped the tablecloth taut in the doorframe using packing tape then cut a slit in the middle for the guests to climb through. I didn't like how much it gaped and you could see the inside of the house, so I used some extra tablecloth that I had trimmed off and taped it behind the slit for a little extra coverage. It worked reasonably well. 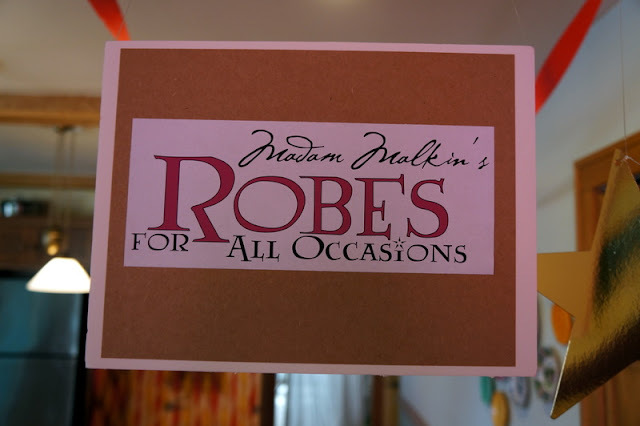 When the boys arrived the had to pick out robes from Madam Malkin's and wands from Ollivander's (signs available here and here). 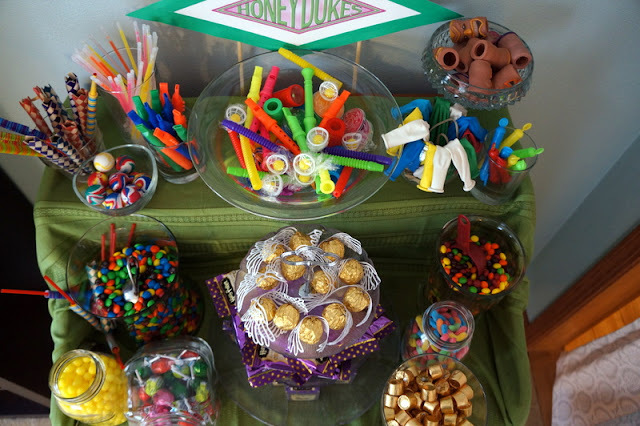 This is the one picture of the day we didn't get..... how these items were set up before guests arrived. Once the boys got their hands on them my pretty setup went out the window. :) I made the robes from black plastic tablecloths and packing tape. (Separate post on how to make the robes here.) 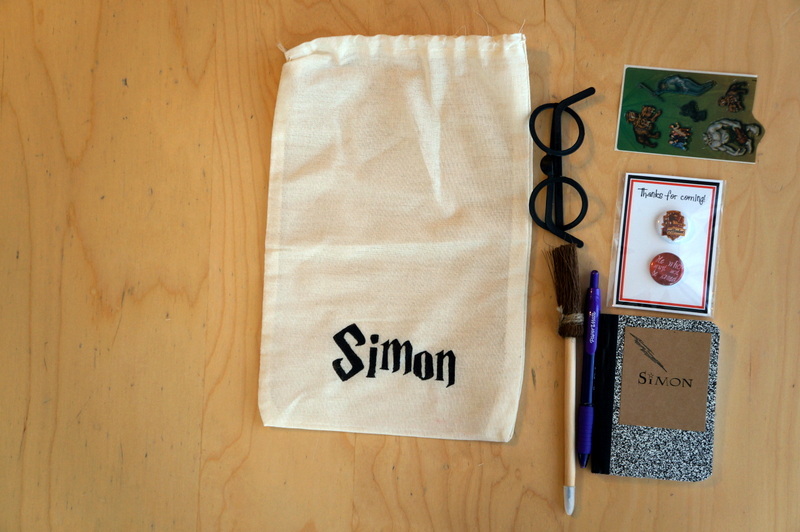 The wands were purchased from this etsy shop for $2 a piece and I cannot say enough about how much I loved them. The wood was strong and beautiful and they were all a little different. Just beautiful. I was afraid, when I ordered them, that they were going to look like sticks I could have picked up in my yard, but they were really something special. I can't say enough about them. 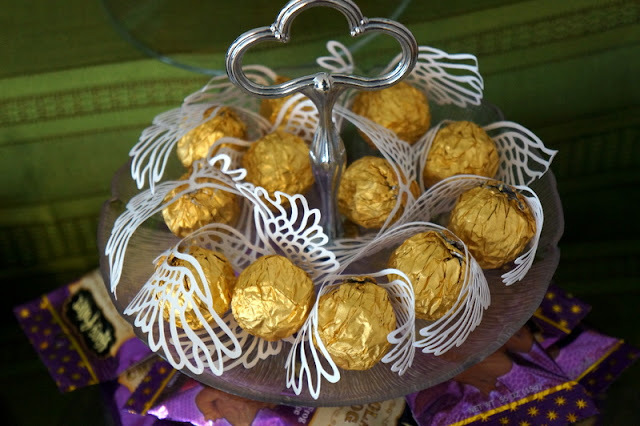 If you can spend $2 a wand for all your guests, then order these! I used a Sharpie to put each boy's initials on the end of the wand so they could tell whose was whose. I think we had a couple mix ups at the end of the day despite my best efforts. Oh well. 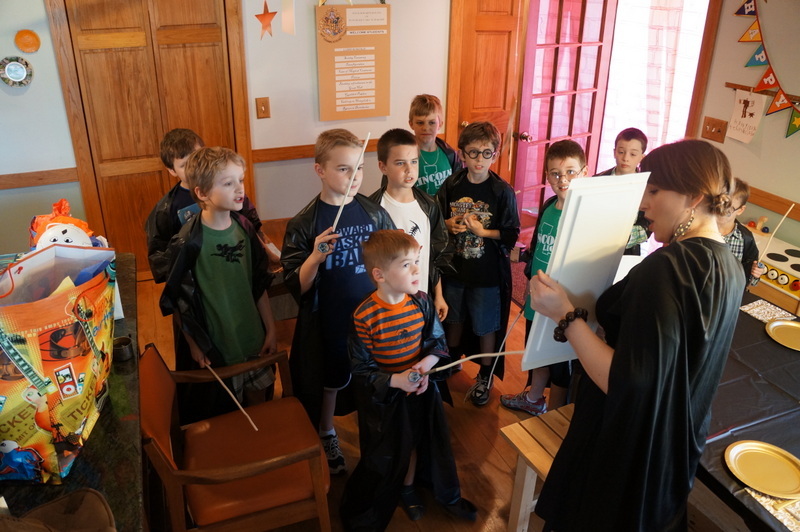 While we waited for everyone to arrive the boys cast spells on each other with their wands and generally congregated in an excited mob in the kitchen. Once most of the guests were there and I could get their attention, I had them sit down in the Great Hall (aka kitchen table). 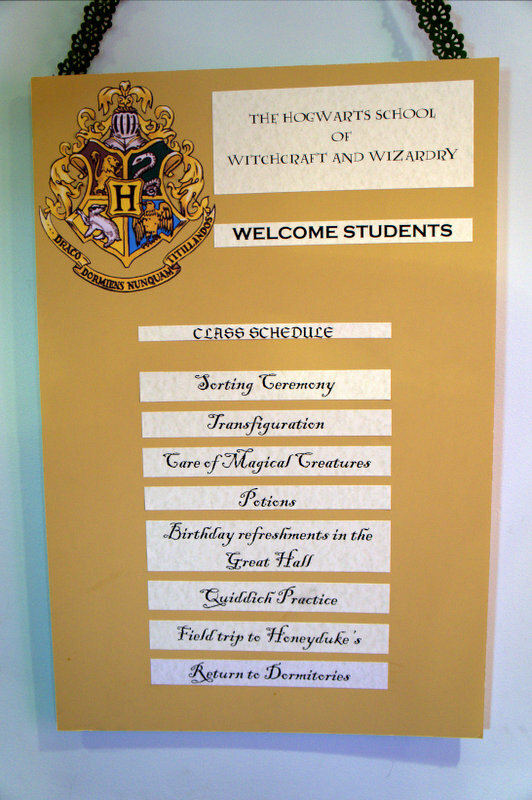 We looked at the schedule for the day and then began our sorting ceremony. Our sorting ceremony was purely for fun. We didn't use the houses to keep points or divide into teams or anything. It was just something amusing to do. 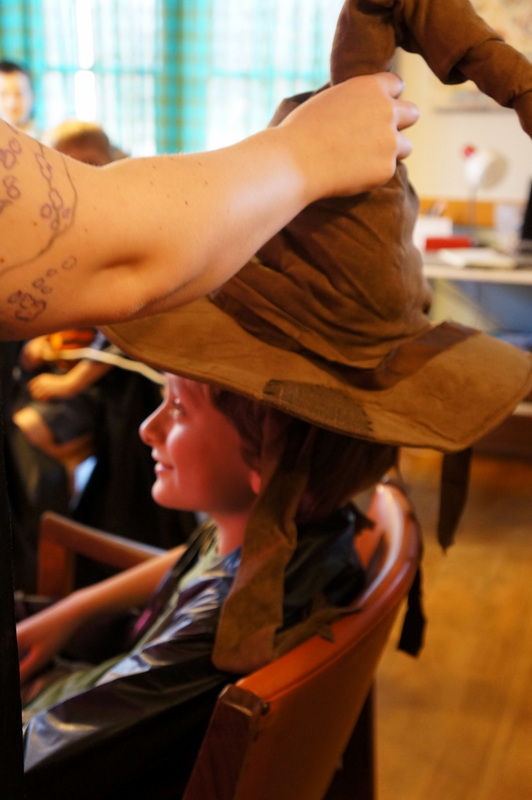 I bought the sorting hat on amazon because a) I didn't have time to try to make one and b) it seemed cool to have one that looked just like the one in the movies. I thought it was worth the $20 or whatever. It turned out that the "hat" I ordered was really a puppet. I wanted to put a baby monitor up in the shaft of the hat and in order to do that I had to rip out some seams in the puppet. I think it will be easily repaired. So a baby monitor went into the hat, and Nate was in the basement with the other end of the monitor. 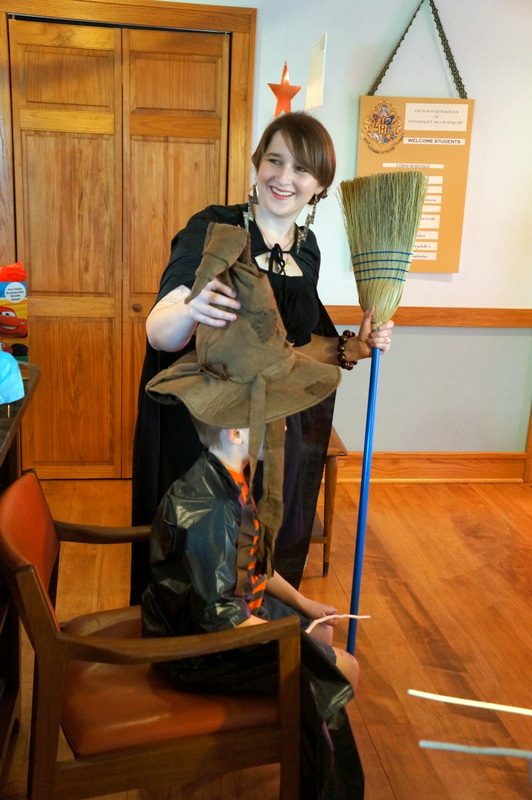 I didn't know if he'd be able to hear me and know when to say the name of a house, so I used a "magical broom" to bang on the floor as a signal for when we were ready for him to say the house name. I stole the baby monitor idea from this blogger's party. The boys seemed to enjoy the sorting. I'm not sure how they thought it was working, but I don't think they guessed that Nate was involved. 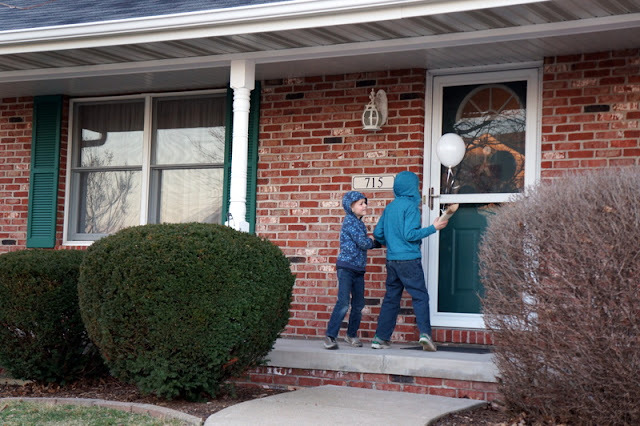 There was a lot of hooting and hollering as the houses were announced; some boys were pleased with their assignment and others did their versions of "aw, shucks." Funny stuff. 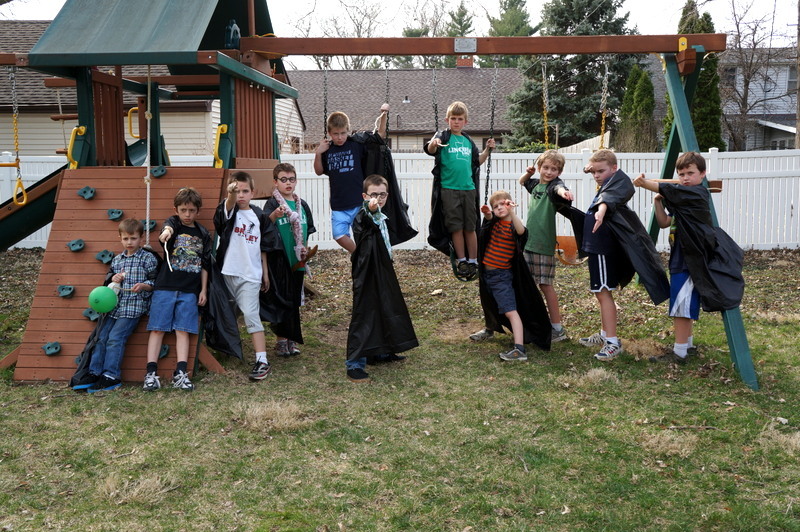 After the house assignment was announced each boy got a plastic ring with their house crest. The rings all broke while the boys were later gripping brooms during Quidditch. Oops. Next was Transfiguration class. Sign available to print here. This activity could have been better organized, I think, and may have lasted longer if it was. 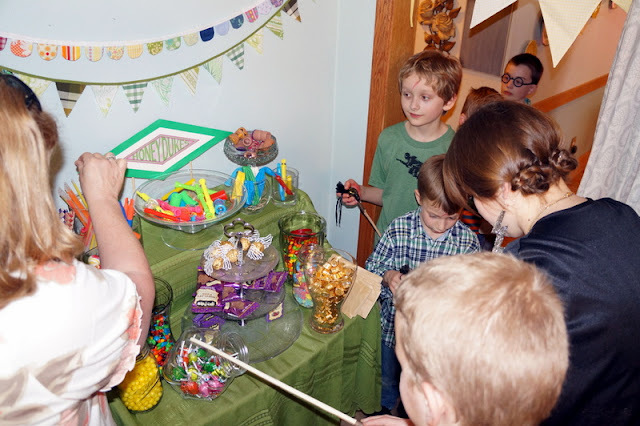 As it was, I gave the boys a basket full of costumes and told them to put something on and then have their picture taken in the "transfiguration booth," which was a corner decorated in streamers. I was hoping they would want to spend some time doing this and enter the transfiguration booth multiple times, but each boy was happy having his picture taken once. Then it was on to the next. Fun, and some cute pics, but did not last long enough. I should have structured it a little more to draw it out. Oh well. During Transfiguration is also when I gave the boys Harry Potter scars, using a lightening bolt stamp and red ink pad, if they wanted one. Next on the list was Care of Magical Creatures. 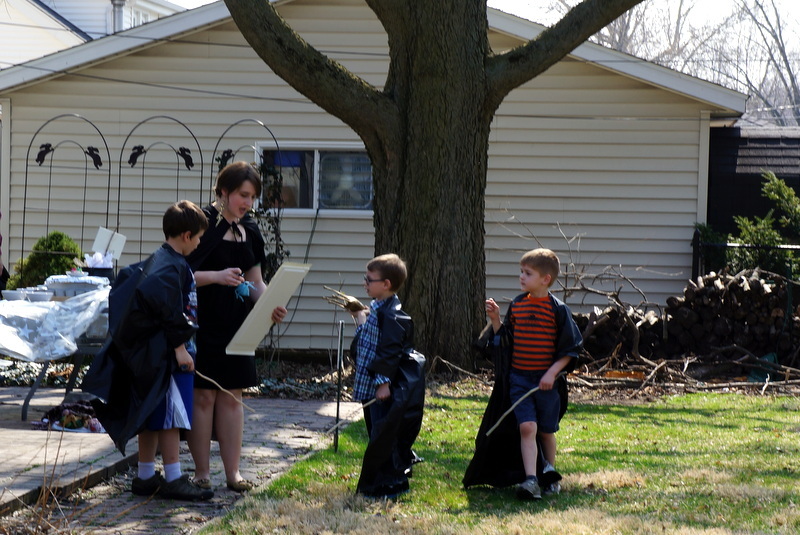 I had the boys gather around and explained that all the magical creatures had escaped. The boys were going to have to hunt for them in the yard. 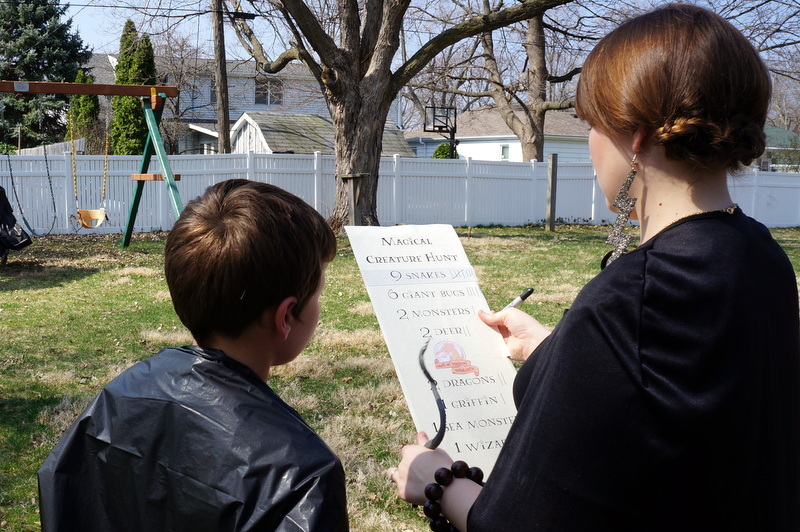 I made a sign that listed the creatures and how many there were to find. As the boys found them and brought them to me, I made a tally by that animal so that we could keep track of how many more we still had to find. The magical creatures were anything we could find around the house that could be construed as even remotely magical. Some were obvious (dragons). Others required more imagination (deer, because of the deer patronus). It was not a competitive hunt; we were working together as a class to round up all the magical creatures. The boys had a lot of fun with this and were really focused on getting the job done! I wished I had had more creatures to hide; once again this activity was over too quickly. After the hunt we moved on to potions. This was truly one of the highlights of the party. We worked outside. The boys had to stand around our patio table because we don't have 11 outdoor chairs, and they wouldn't have fit around the table anyway. So they stood and listened to me give instructions for making our two potions. 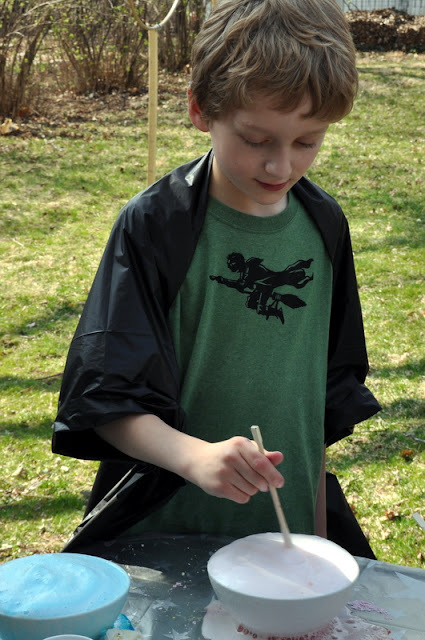 We stirred our potions with chop sticks so they didn't have to get their nice wands wet and messy. I had everything measured out in little plastic cups with the ingredient names written on the cup and color coding dots to help keep them straight. 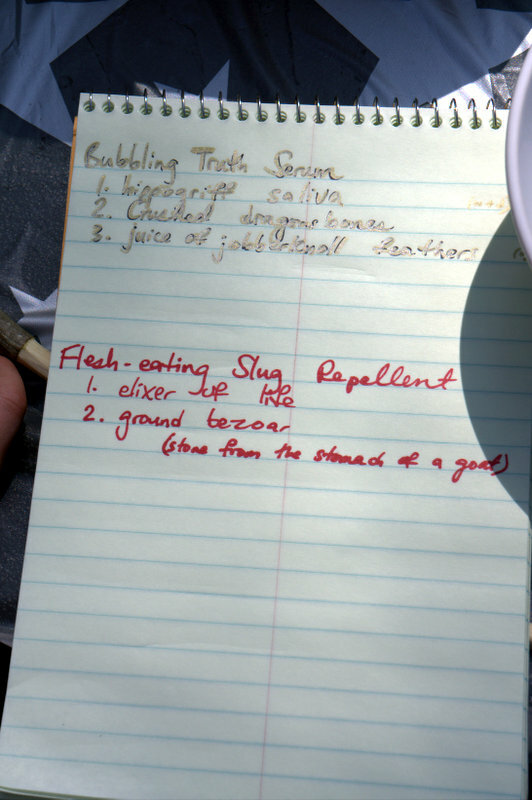 Potion 1 was Flesh Eating Slug Repellent. Ingredients were elixir of life (water) and ground bezoar (corn starch). I let the boys add food coloring to the water. First we mixed with our chop sticks, then I told them to mix with their hands because this mixture is such a cool tactile experience. After we played with it for a little while, the boys formed a line to rinse out their bowls and clean off their hands with the hose. I got into the spirit of the party with my outfit. I had most of it in my closet... a simple black dress, a gold belt and some gold necklaces. I purchased the amazing lightening bolt earrings here. The cape was part of a Darth Vader costume that my mom found. Potion 2 was Bubbling Truth Serum. 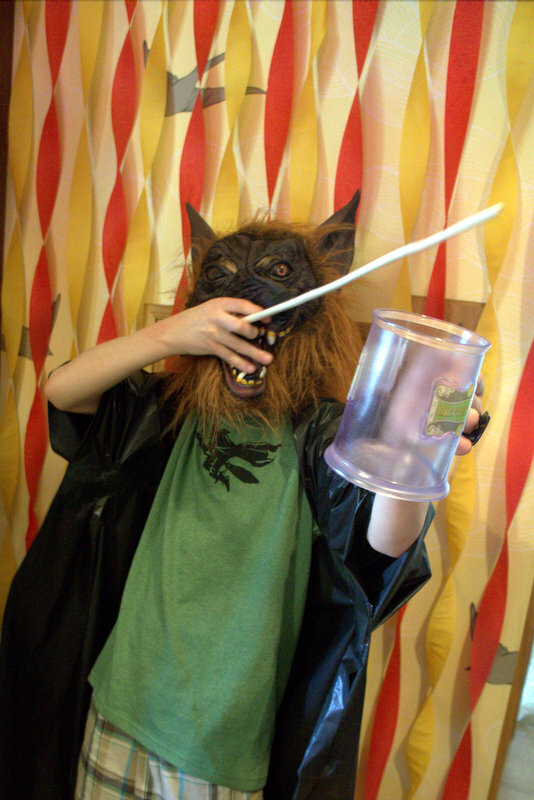 Ingredients were hippogriff saliva (water and a few drops of dish soap), crushed dragons bones (baking soda), and juice of jobberknoll feathers (vinegar). Again I let them add food coloring at the stage when we had just water in our bowls. This potion was definitely the crowd favorite. 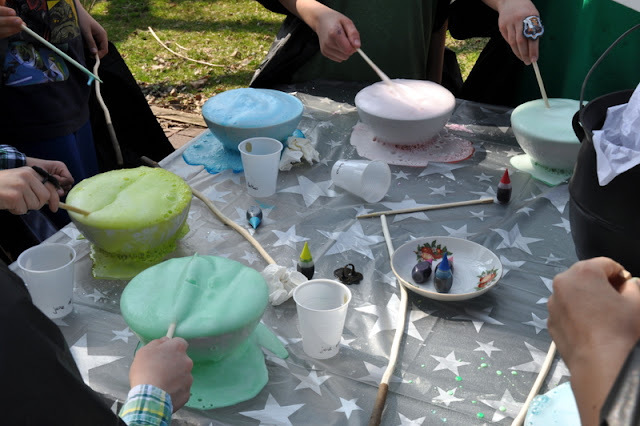 I tried to get them to all pour in the vinegar at the same time, and their reactions as the potions bubbled up and over the sides of their bowls were priceless. So fun. After potions we came in for refreshments. 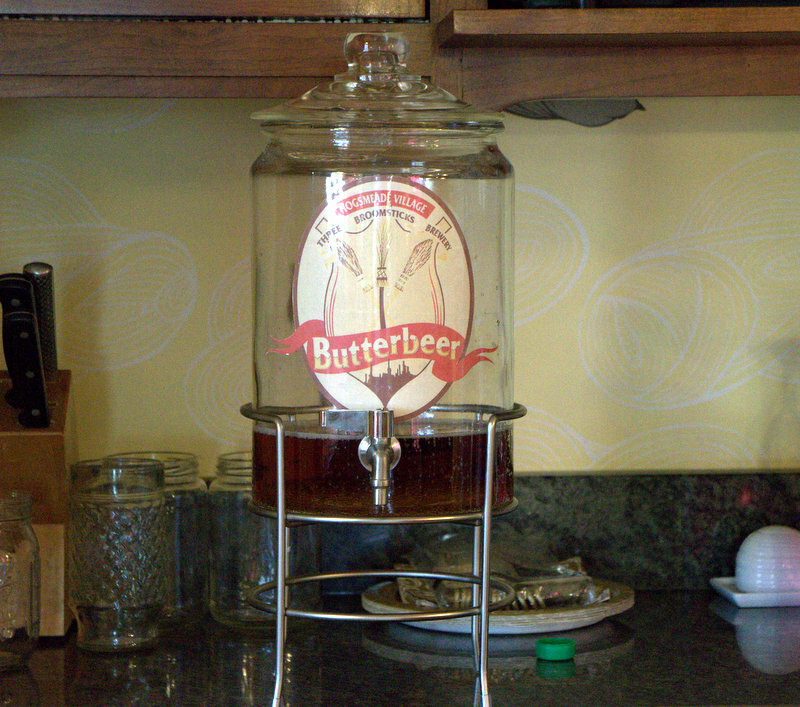 I didn't really do any special Harry Potter food. 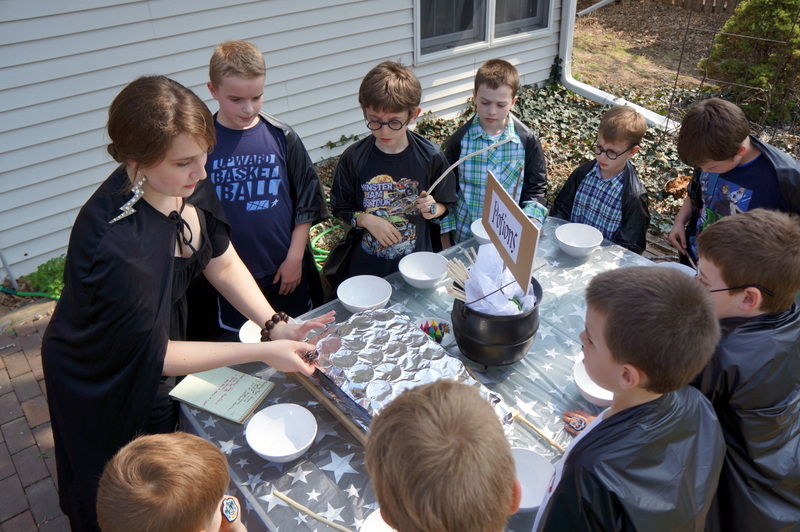 There are so many great recipes for pumpkin pasties and other themed foods, but in the end I decided my audience (9 year old boys) probably didn't care much about special HP themed snacks, so I let it go and spent my time elsewhere. 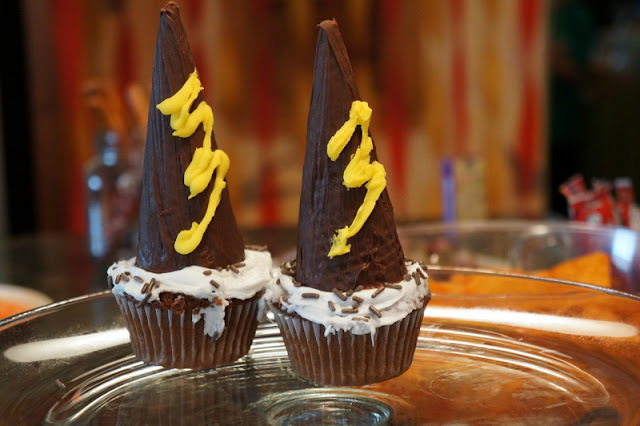 We had some basic snacks and I tried to recreate these cupcakes. My lightening bolts were rather poor, but oh well. For beverages we gave the boys a choice between butterbeer (straight up cream soda, whipped cream optional) and "magical color changing soda." The latter was kind of a bust. I think I did too much too coloring because you could totally see what color it was going to be before the soda went in. Not too magical after all. No complaints from the boys, though. 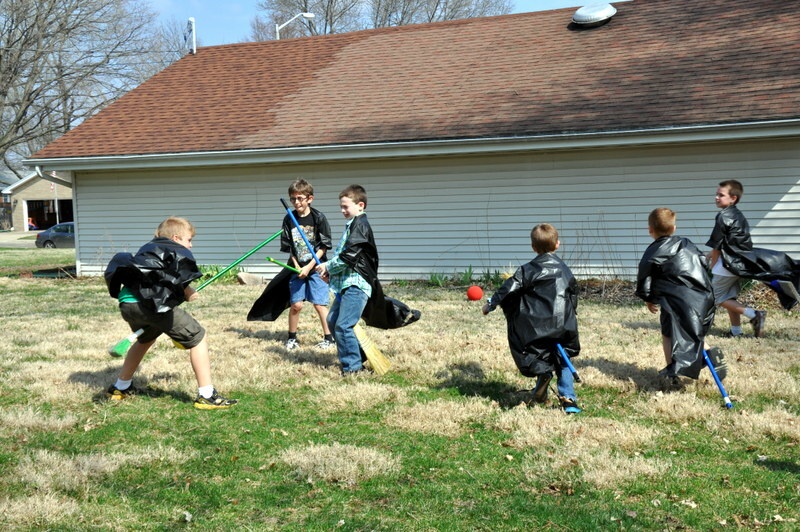 They were still into our theme and rarin' to go for some Quidditch. 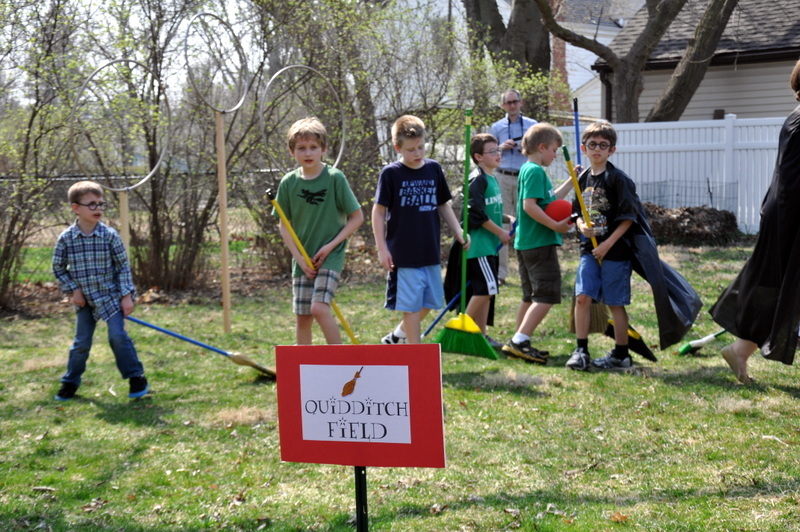 Back outside for Quidditch! 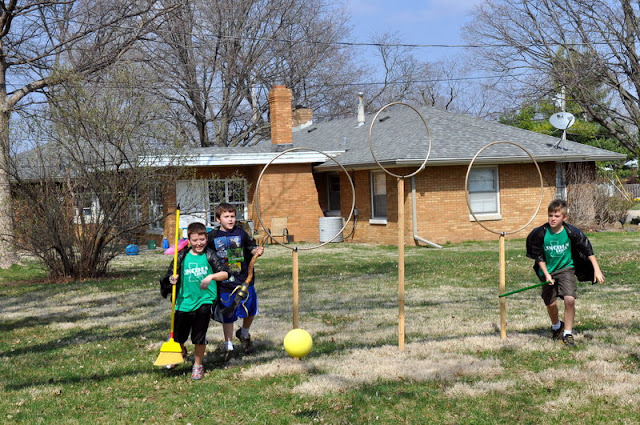 We made our Quidditch hoops using hoola hoops, spray painted gold, and 2x2 posts, cut down to size and pounded into the ground. We attached the hoops to the wood using some rubber-coated clamps. The hoops would fall down occasionally but when someone put them back up they would stay for a while before falling again. I divided the boys into teams randomly and explained the game, which was a very loose interpretation of the game in the books. Basically we had a golden snitch (golf ball painted gold) that I hid somewhere in the yard. Two of the boys were seekers and spent their time hunting for this golf ball. The rest of the boys were busy trying to get the quaffle through the hoops. Two boys were bludgers and were throwing balls at the other boys. If a boy holding the quaffle got hit by a bludger he had to drop it. The rules were very loose and we didn't do much refereeing. I thought it was chaotic and I don't think I would have liked such an unstructured game as a kid. But the boys seemed to love it and played it for longer than I expected. It was quite a warm afternoon. They took their robes off after a while, but then kept right on playing. They took turns being seekers and bludgers. 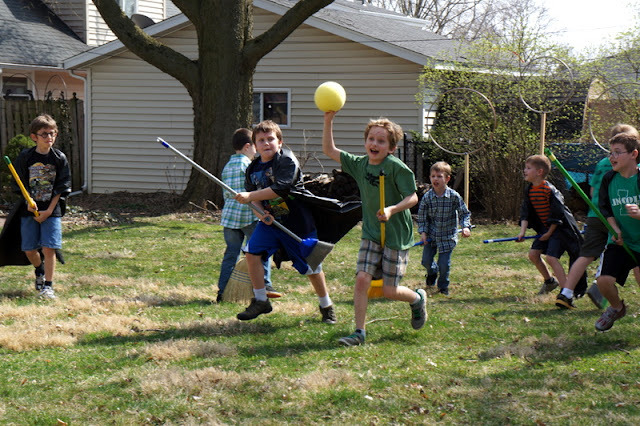 Quidditch was another highlight for the boys, I think. Right up there with potions. 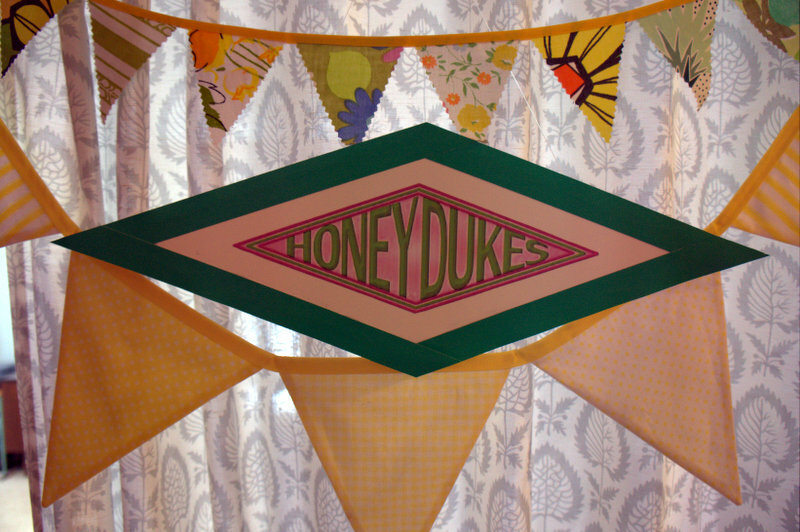 While the boys were in line for Honeyduke's I handed them their favor bags. 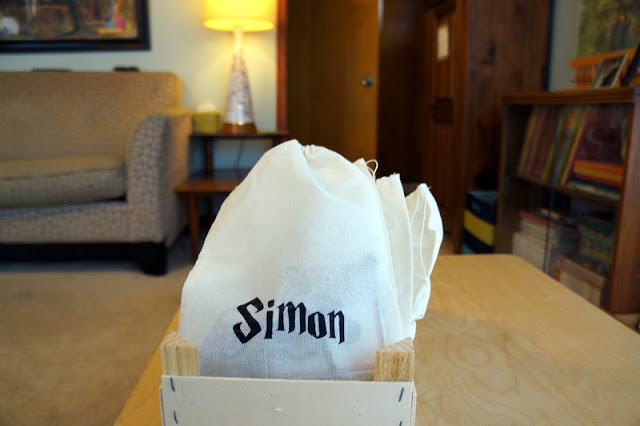 (I had painted their names on muslin bags, purchased here, by making a stencil with my Silhouette. The bags had a few goodies in them already. The boys got to take those things home, plus their wands and whatever they got from Honeyduke's). The idea was for them to put their Honeyduke's loot into the larger bag and close it up until they went home. This, of course, was not how it played out. They sat down in the living room and spread out their loot on the floor, eating candy, playing with toys, and trying disgusting every-flavor beans. While all this was going on S opened his gifts. I didn't really have a problem with this at the time but in hindsight I wish I had made them keep all their stuff in their bags. 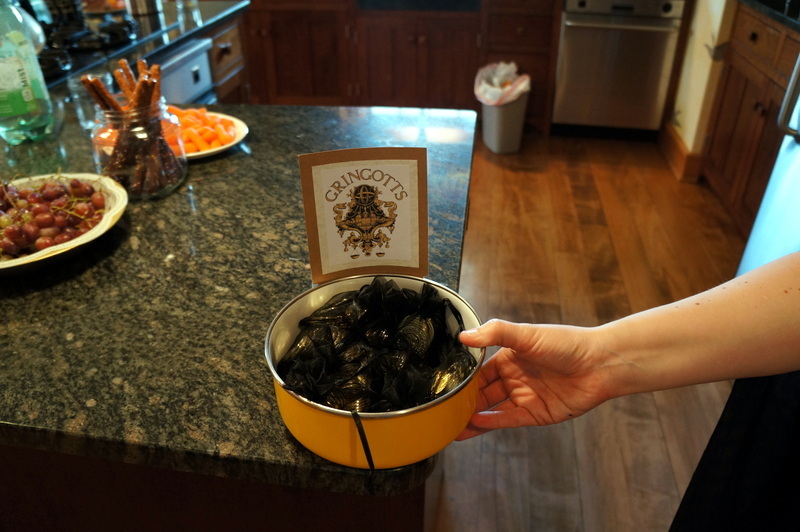 When it was time for our guests to go home, their loot was scattered all over the floor. Some of them carefully gathered everything up before they left. Others went home without most of their goodies and I felt bad when we discovered them later. Once gifts were opened and favor bags were distributed and scattered all over my living room, we still had an hour before parents came! All the activities had taken much less time than I anticipated. So the boys went back outside to run around and play. They did a great job, played well and got along, playing Deatheaters vs. good wizards. 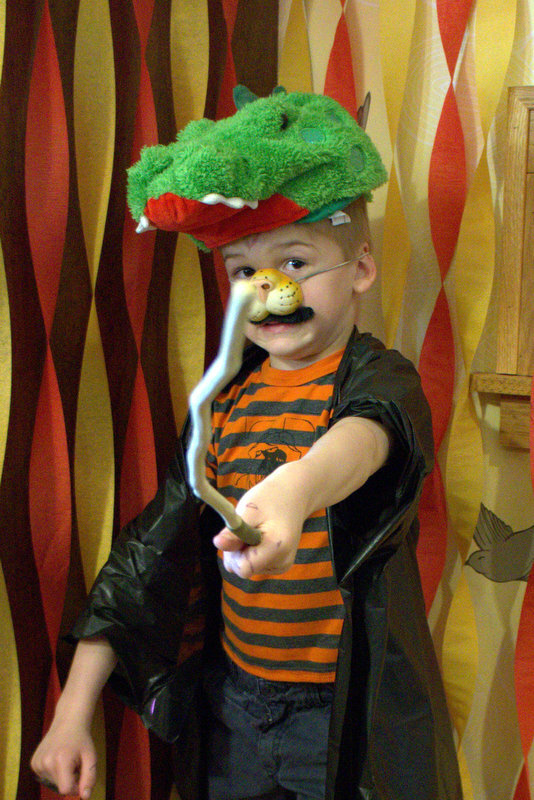 Only one kid got poked in the eye with a wand. It was a beautiful day and I was glad they could spend the extra time running around outside. 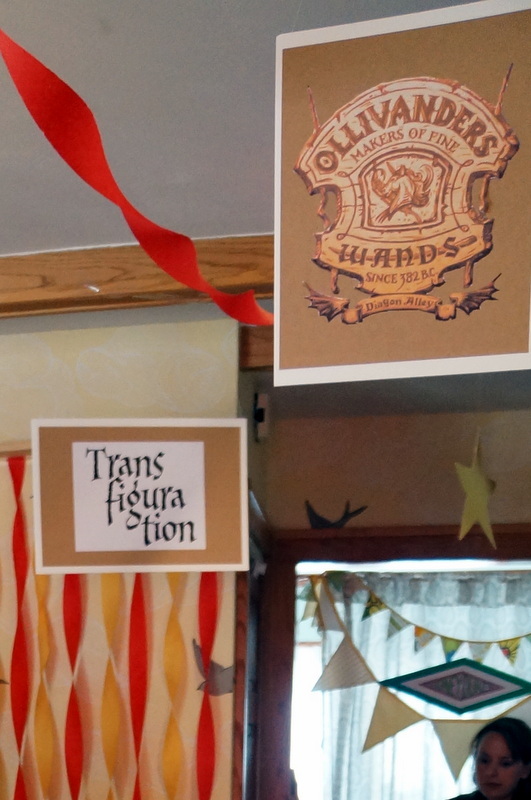 Here ends my tale of The Day We Threw a Harry Potter Party. All in all I'm extremely pleased with how it turned out. I had a lot of help with this party. Nate put up with two solid weeks of manic planning and preparations, and didn't even bat an eye while the receipts kept piling up. My mom and sister helped me decorate and collect props. My sister in law and mother in law came and helped during the party, thank goodness. I really needed the extra hands! My dad and Nate were my cameramen during the party and they did a fantastic job of covering everything. Most importantly, I think S and his friends had tons of fun. I hope all the other parents don't hate me too much for throwing a ridiculously elaborate party or for sending their kids home with buckets of candy. But every once in a while I just have to do this for my kids. Now I'm going to have to throw a big shindig for T. Not this year, though. I need a little recovery time after this one. Holy. Moly. Girl, you outdid yourself. This is AMAZING. Looks like the best party ever. WoW! Saw this on Pinterest! You did a FANTASTIC job with everything! I wanted to be at that party!! Your party was amazing!! Thanks so much for sharing it with us. 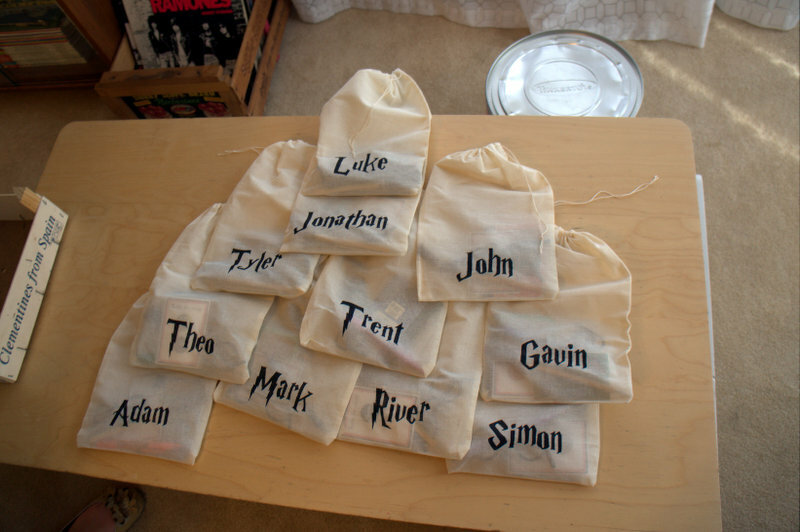 We’re throwing a HP party next week and I’m trying to decide if I’m crafty enough to make the robes for 12 kids. I originally thought I’d use black trash bags, but then I saw that you used table clothes. Any tips for making them look ok? Thanks so much! Hi - I too would love further directions on how you did those capes. I want to do the same in 2 weeks...but I am not very creative or crafty to figure it out on my own! I would very much like the cast of Snitch wings to cut the silhouette would be possible to send me ? So glad I found this although I know it's a couple of years old you've given me several wonderful ideas for our upcoming HP party... looks like your son and friends had a blast, great job! Thank you, Laura! 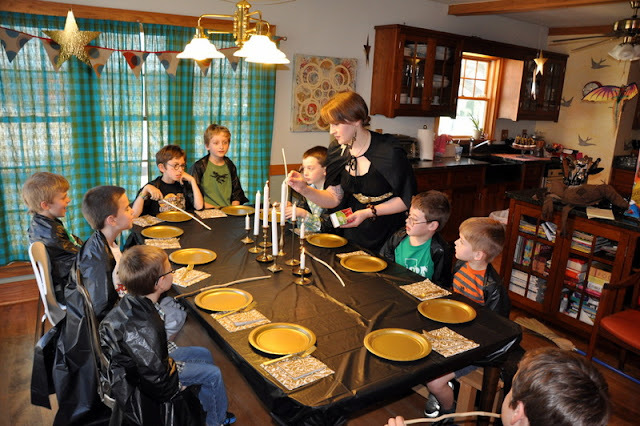 Your ideas inspired the Harry Potter party that I just threw for my son this afternoon. Not quite as elaborate as yours, but very close. It will definitely be one that he (and his friends) will never forget. I just wanted to say that I really appreciate you sharing your party pics and tips.. they made it so much easier than looking up each activity on its own.